What does the horizontal flag on the G1000 flight plan page mean? 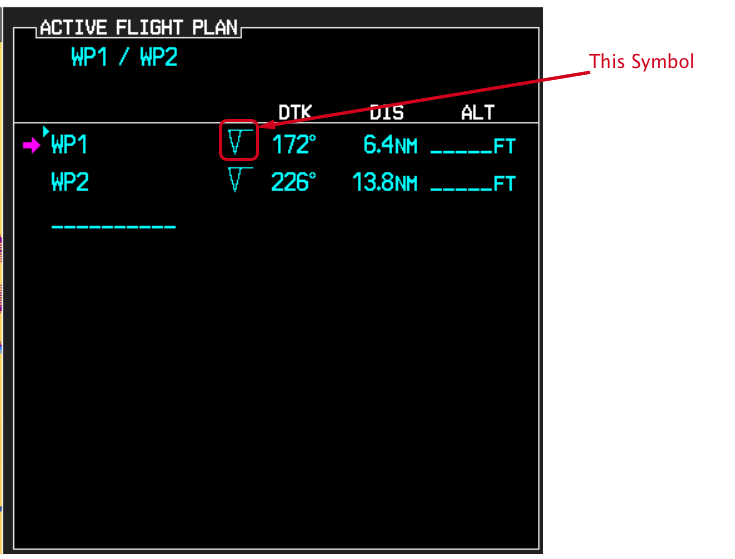 METAR flags and their associated text are displayed on the Active Flight Plan Page on the MFD. METAR flags appears next to waypoints in the flight plan with an associated METAR. A solid light blue METAR flag indicates the METAR observations are available for a specific waypoint; a hollow light blue METAR flag indicates an off-route METAR near the waypoint is available. When off-route METAR text is displayed, the system provides additional information as to the origin, distance, and direction of the report in relation to the selected flight plan waypoint. The ones you have are the 'hollow light blue'. Not the answer you're looking for? Browse other questions tagged g1000 or ask your own question. Is it possible to isolate COM1 and COM2 on a Garmin G1000?